Drawing on American history, literary legend, and folk tale, Angela Carter transports us to that shadowy country between fact and myth in this book of short stories. Lizzy Borden, the spinster daughter of a glutton and a compulsive miser, ticks off the hours before a murder. An eighteenth-century whore and pickpocket who runs off to join the Indians tells her story in a voice of bawdy authenticity. Carter immerses us in the worlds of Edgar Allan Poe and Charles Baudelaire, of khans, princesses, and kitchen boys, bringing them to life in prose of seductive richness and perverse wit. In The Bloody Chamber, said The New York Times Book Review, Carter rewrote classic fairy tales "with all her supple and intoxicating bravura." 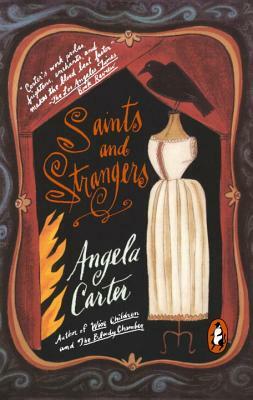 In Saints and Strangers, she is just as audacious, and the result is a book of thoroughly contemporary folk tales that belong utterly to Angela Carter.